Whenever we used to see amazing calligraphy projects, we were immediately both fascinated and intimidated. No more! Thanks to the skill (and patience) of artists such as the fantastically talented Andrew Fox, anyone can dabble in the art of calligraphy – and trust us, it’s way easier than you’re thinking. We tried out a project from his new how-to-guide, Learn to Draw Calligraphy Animals, and fell in love – we know you will, too. Here are our reasons why we think it’s a great! 1. How welcoming and inspiring are these first few pages? Fox invites us to dream, imagine, and explore a new art form, encouraging us to lose ourselves in creative pursuit – and we are ready! 2. The step-by-step, guided instructions are perfect for beginners! Fox breaks each animal down stroke by stroke, showing the reader which direction to draw in and what angle to hold the marker at. 3. There are SO MANY adorable animals to choose from! Bats, bears, crabs, reindeer – the list goes on and on. 5. It’s way easier than you’d think – anyone could try it! We tried the bat project and – even though our hands were shaking from too much caffeine – we were pretty happy with the results. Fox invites his readers to show off their calligraphy projects online and create their own designs! 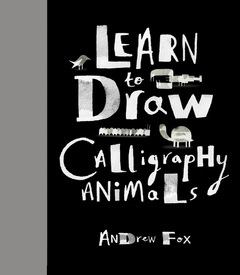 We think that Learn to Draw Calligraphy Animals makes for the perfect gift – for the creatively inclined, the aspiring calligraphy master, the animal lover, or all of the above – and what’s more: we know you will, too! The technique is easy, and with a few marks of a pen, you can create an amazing animal drawing.